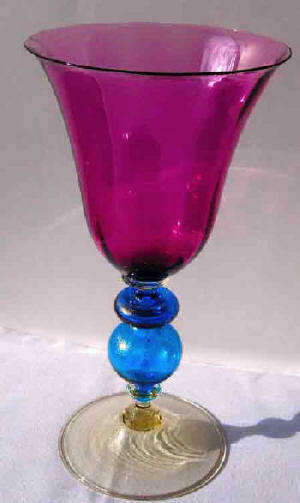 This page contains a small selection of antique coloured drinking and liqueur glasses from our stock. The following factories are always in stock, Stevens & Williams, Moser, Heckert of Petersdorf, Meyr's Neffe and Baccarat. 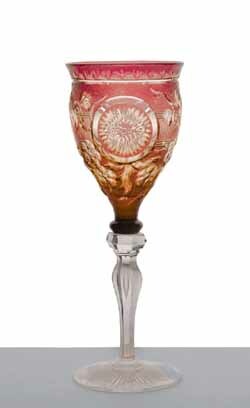 We also have other glasses from the Victorian and Edwardian periods. To request availability please visit our contact page. decorated with a green cameo leafed vine with gilded fruit and tendrils, Late 19th Century. 2nd quarter of the 20th Century, Stourbridge. Vienna, 1895-1905, 7 1/4in (18cm) approx. the red petals with pale bands to centre intersperced with green stamens on a pale green stem, circa 1900.
the petals of red with pale bands to the centre intersperced with green stamens. circa 1900.
green overlay cut through to clear, circa 1898.
the graduated pink petals outlined and details in black, on a green stem, circa 1900. Lobmeyr Mark from the suite of drinking glasses. A suite of Lobmeyr Drinking Glasses. A detail of the previous glass. decorated with applied red and green 'jewels,' Mid 19th Century. With acknowledgement to the Glass Circle. from the Duke of Sussex service, decorated with a red line laurel wreath on the wide gilt band rim, the hobnail cut body with finely enamelled classical head depicting the Greek God Prometheus, titled beneath, 4 3/4in (11.8cm), London 1820-1830. This piece was exhibited at the 'From Palace to Parlour' exhibition, held at the Wallace Collection, London, item No 13. Jolly Rare. for Poschinger, Oberweilslau, Munich, c.1906, the body colour of amethyst richly jewelled with faux turquoise and gem stones of green and amethyst, intersperced with fine gilded scrolls, 6in (15cm) approx. with acid etched Parisian view of the Place de la Bastille, Paris, c.1875, 3 1/2in (9cm). £295. on a turquiose blue glass stem and foot, Meyrs Neffe, c.1895-1905, 6 1/4in (15cm) white enamel to numerals to base 585.
the clear bowl decorated with orange 'dots' on a pale lilac trumpet stem, circa 1905. 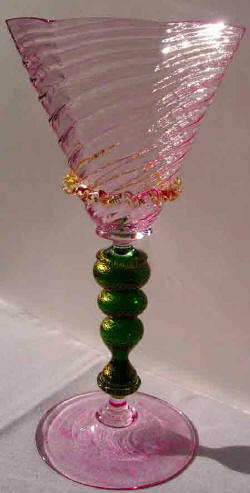 A group of decorated liquer glasses which appear when grouped to be a patch of wild flowers growing in a meadow. the wrythen pink bowl applied with a frill towards the base upon green adventurine stem above a pink foot, 2nd quarter 20th Century. £595. 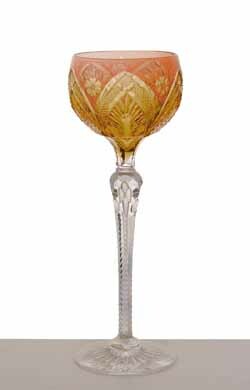 decorated with a chrysanthemum amid prunus blossom on a cracked ice ground, the bowl on inverted baluster stem with air inclusion, typical starburst cut foot, circa 1900. Slightly taller than normal Stourbridge hock glasses. For more Stevens and Williams Glasses go to 'British Glass' Stevens and Williams Section.